Crafted in a smaller size, but delivers the same outstanding smoking experience as the rest of the Ashton hand-rolled premium cigar line. 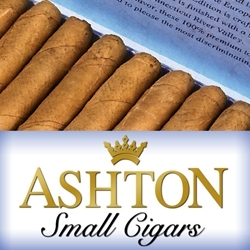 Ashton Small Cigars are manufactured in the European Union, still hand rolled despite their petite size using vintage Dominican tobaccos and bundled up perfectly with a choice of a rich tasting Connecticut Shade or a zesty Cameroon wrapper. Ashton Small Cigars are offered in a package of 10 packs of 10 cigarillos each. Both the Natural and Connecticut styles of Ashton Small premium cigars provide a sweet and smooth smoking experience for the connoisseur who enjoys the relaxation of a high-quality cigar or just needs a quick smoke on the run. Ashton Small Cigars can be delivered right to your doorstep! Smokers Discounts has made it easy and affordable to buy premium hand rolled cigars online. A variety of sizes and flavors are listed below in our online cigar store. Each of these styles are in stock and available for a low discount price! Call us for more details!